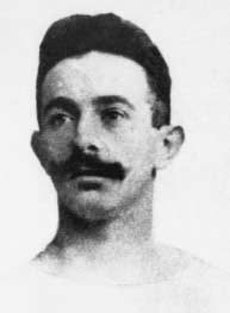 Alfred Flatow won three gold medals in Athens, Greece, at the first modern Olympiad in 1896. He also won a silver medal. Alfred and Gustav Felix Flatow were among ten athletes selected to compete for Germany in the Athens Games. Alfred captured his gold medal honors in Individual Parallel Bars, Team Parallel Bars, and Team Horizontal Bars. He took the silver medal in the Horizontal Bars event. In 1903, Flatow assisted the founding of the Judische Turnerschaft, the historic and pioneering Jewish sports organization in Europe. He was prominently active in German gymnastics until expelled by the Nazis in 1936. Alfred Flatow died in the Theresienstadt concentration camp in 1942. In 1997, the City of Berlin honored the memory of Alfred and cousin Gustav Flatow by renaming its Reichssportsfeld Strasse (street of the National Sports Complex) Flatowallee (Flatow Blvd.). The following year, the German Postal Service issued a set of four stamps commemorating the (1896-1996) Olympic Centennial. One of the stamps (200+80 marks) features Germany’s first Olympic gymnastics champions, Alfred and Gustav Flatow.